A French Heirloom butterhead lettuce introduced in 1885. The name means �Four Seasons� not only for its ability to hold its flavor in even warm weather, but for it�s beautiful colors; deep burgundy, pink, pale green, and creamy yellow. Reddish Butterhead type head with crisp leaves of excellent flavor. Will develop dark red color during cool spring or autumn weather. Plant seed outdoors as soon as the ground can be prepared. Plant Lettuce in rows 18 inches apart spacing seeds 1 inch apart. Cover seed with 1/8 inch of fines soil, well pressed down. Keep moist until seeds sprout. When plants are 3 to 4 inches tall, thin spacing plants 8-10 inches apart. For continuous harvest, plant every few weeks all season. 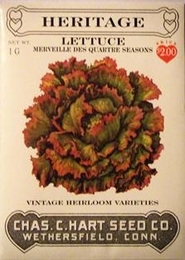 Bulk Heirloom Lettuce seed available. 20000 Seeds/oz. Plant 1/4oz per 100ft row. 1lb of Heirloom Lettuce seed needed per acre. 4oz needed per acre if using transplants. On average, 1oz of seed can produce 1500 Heirloom Lettuce plants.